Cora Coralina was a Brazilian. She was born in Goias Velho which is the ancient capital of Goias, Brazil. She was Writer and Poetess. She started to write her first texts when she was 14 years old. She was a believer in sweets more than writing. She thought that the sweet candied cashew, pumpkin, figs and oranges which charmed the neighbors and friends worked better than the poems written on sheets of notebook paper. She published her first book after her husband died. 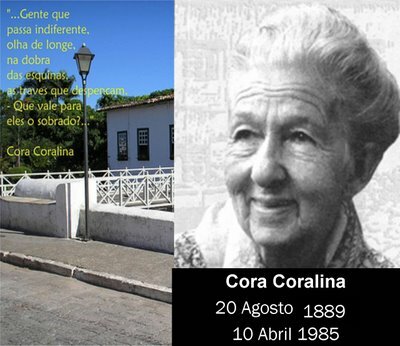 Cora continued to produce more books, becoming one of the most important Brazilian writers of her time. She wrote a lot of books and poems. Her house inspired some of the beautiful poems written by her. There is a small museum in the house to honor her. If life is short or too long for us. If not touching people’s hearts. Many times we simply are. I made this poem when I was 13 years old.